Will House Republicans “Jump Off the Cliff” and Cut Healthcare for 24 Million Americans? | Democracy Now! Will House Republicans “Jump Off the Cliff” and Cut Healthcare for 24 Million Americans? professor at the Harvard School of Public Health and former executive director of Health Care for All in Massachusetts. As President Trump and House Speaker Paul Ryan face a showdown with Republicans, both moderate and conservative, on whether to repeal Obamacare, the party has been scrambling to rewrite the legislation in order to appease members of the right-wing Freedom Caucus and win its passage. The latest version of the bill strips away provisions that would require health insurers to provide basic services including maternity care, newborn care, emergency services, mental health and addiction treatment. The Democratic Caucus has been united in opposition to the bill, which is projected to leave 24 million fewer people insured by 2026 than under Obamacare. The bill also includes over $275 billion in tax breaks for wealthy Americans. We are joined by John McDonough, professor at the Harvard School of Public Health. He is the former executive director of Health Care for All in Massachusetts, which played a key role in the passage of the 2006 Massachusetts health reform bill, which was known as Romneycare. He later became a top aide to the late Senator Ted Kennedy and worked on the development and passage of the Affordable Care Act. AMY GOODMAN: President Trump has issued Republican lawmakers an ultimatum: If the Republicans don’t pass a healthcare bill today, he will leave the Affordable Care Act in place. Trump made the threat Thursday, hours after House Speaker Paul Ryan called off a vote on their plan to overhaul the U.S. healthcare system, after failing to win enough support from their party’s ranks to overcome Democratic opposition, despite heavy lobbying from the White House. On Thursday night, Ryan said a vote will take place today, even though it remains unclear if he has enough votes to pass the new healthcare law. SPEAKER PAUL RYAN: For seven-and-a-half years, we have been promising the American people that we will repeal and replace this broken law because it’s collapsing and it’s failing families. And tomorrow we’re proceeding. REPORTER: You have the votes? Do you have the votes? AMY GOODMAN: In recent days, Republicans have been scrambling to rewrite the legislation in order to appease members of the right-wing Freedom [Caucus]. The latest version of the bill strips away provisions that would require health insurers to provide basic services, including maternity care, newborn care, emergency services, mental health and addiction treatment. On Thursday, White House Press Secretary Sean Spicer faced questions about cutting maternity care benefits. MATTHEW NUSSBAUM: About this essential benefits protections, obviously among those is maternity leave. So how would removing that jibe with the president’s promise during the campaign to expand maternity leave? Obviously, this would take it out, and insurers would no longer have to provide that. PRESS SECRETARY SEAN SPICER: Yeah, and again, I don’t want to get into a benefit-by-benefit discussion here, but I think that there’s a lot of concerns, as I just said to Blake, that part of the reason that premiums have spiked out of control is because, under Obamacare, there were these mandated services that had to be included. And what happened was, is that, you know, older men, older women, who had gone past maternity age, were buying benefits that weren’t necessary for them. People who were at the younger end of the—of the age scale were buying end-of-life benefits. On Thursday, when a reporter asked Republican Senator Pat Roberts if he supports scrapping essential health benefits, he responded, “I wouldn’t want to lose my mammograms,” unquote. Roberts later apologized. Democratic Congresswoman Judy Chu responded on Twitter by saying, “Cancer is no joke. Mammograms save lives. Same reason we pay for prostate exams. Government shouldn’t decide what care women can access,” unquote. The Democratic Caucus has been united in opposition to the bill, which is projected to leave 24 million fewer people uninsured by 2026 than under Obamacare. The bill also includes over $275 billion in tax breaks for wealthy Americans. For more, we go to Boston, where we’re joined by John McDonough, professor at the Harvard School of Public Health. He is the former executive director of Health Care for All in Massachusetts, which played a key role in the passage of the 2006 Massachusetts health reform bill, which was known as Romneycare. He later became a top aide to the late Senator Ted Kennedy and worked on the development and passage of the Affordable Care Act. He’s also author of the book Inside National Health Reform. Welcome to Democracy Now!, John. Thanks so much for joining us again. Can you talk about this latest bill that’s expected to be voted up or down today in the House of Representatives? JOHN McDONOUGH: Well, Amy, so the latest bill is still a work in progress. And as of last night, the House Republican leadership was throwing concessions to the Freedom Caucus and concessions to the moderates. And so, what is actually in or out is still seemingly a work in progress. And the Rules Committee is preparing to allow this without any real delay in time. But what has gone on since last evening is a reframing of this issue in a way that may play to the Trump and Ryan forces’ advantage. They’re reframing this as: Do you or do you not want to get rid of the Affordable Care Act? And that reframing kind of moves it away from the fracas around this provision or that provision. It’s highly uncertain—I’d say right now the odds are against its passage today. But one really has to be cautious about that, because there is a shift in terms of the nature of the conversation within the Republican Caucus. They are at a cliff right now. And they’re either going to jump over the cliff or not. And there are forces going in both directions right now, which makes it awfully hard to predict what will happen six to eight hours from now. AMY GOODMAN: So, this number, 24 million Americans will lose healthcare. The Quinnipiac poll, just out, on President Trump’s handling of healthcare says 61 percent disapprove. The question they ask: Do you approve or disapprove of the GOP healthcare plan? Fifty-six percent disapprove. 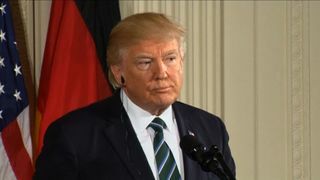 Gallup President Trump job approval poll: 56 percent disapprove. What will happen now? You’ve got 24 million Americans who would lose healthcare over the next decade. And then you’ve got what many are calling the mommy tax. Explain the current plan, where the essential benefits would be pared down to exclude maternity care, newborn care, mental health services and other services, Professor McDonough. JOHN McDONOUGH: So, in the Affordable Care Act, in Title I, the private insurance part of the law, there is a provision for what’s called essential health benefits, which are the 10 core medical care services that need to be included in just about all health insurance that is sold in the United States or provided to people, and it includes prescription drugs, inpatient/outpatient services, mental health and substance abuse, maternity care, rehab services, other kinds of things. And this makes sure that when people buy health insurance, it includes the kinds of things that one would normally expect to see in that kind of policy. The Freedom Caucus, which is the renamed form of the tea party, is determined to take apart most of those secure provisions in the law, and other things, as well, beyond essential health benefits, which is the conflict right now between them and the House leadership. And in so doing, they would degrade health insurance so that people could buy health insurance at much more affordable rates, but it would be policies that are not worth the paper it’s written on. It would bring back lifetime and annual benefit limits. It would not cover things like maternity, mental health or other kinds of essential services. So it would be really a degraded form of health insurance. And people then have the freedom of choice, and that is what they refer to when they use words like “patient-centered care.” I think that most people are getting a wonderful education over the past 24 hours of what we mean by what is health insurance and what is not. And people are looking at the list and saying, “You want to take that away from me.” And I think people are alarmed. And so, you know, for whatever we can say, this has just been a phenomenal education over the past four months in what health insurance is, how it works and what’s at stake when you try to change one thing versus another. And the stakes are very high. But it’s also clear that there’s a national momentum all across the country, in red and blue districts, of people rising up and standing up and saying, “No, we can’t accept this degrading.” And for me, the number is only 17 percent of people in that poll you referenced say they support the GOP health reform legislation, the American Health Care Act. And so, it’s been—it’s been a really remarkable turn of events in a very short period of time. AMY GOODMAN: You talk about the momentum across the country. A number of activists descended on Washington, D.C., Thursday to protest the new American Health Care Act. Organizers said 24 people were arrested in order to represent the 24 million people who will lose her healthcare over the next 10 years, according to this bipartisan Congressional Budget Office report. This is construction worker Alex Bauman, followed by protester Tanetta Wilson. ALEX BAUMAN: I work in construction, so I’m at pretty high risk for some physical injuries. If I didn’t have health insurance and had to just rely on the emergency room, it’s—everything after the election has been just so stressful for all of us. You just have to—like, I’ve invested more heavily in safety equipment. I’ve turned down some contracts because they seem more physically risky. And I might not get to keep the health coverage that I have, so I’ve had to turn down work. I’ve had to turn away some income, which doesn’t make it any easier to afford the insurance then. AMY GOODMAN: Protester Tanetta Wilson. TANETTA WILSON: We’re protesting and rallying here for the healthcare reform bill, to make healthcare affordable for low-income people, our senior citizens, to make the medication affordable for people. And that’s why we’re here, to fight the healthcare insurance bill, because we don’t know what’s going to happen after that. AMY GOODMAN: —you say it’s not worth the paper it’s written on? I mean, I think the average—they’re saying the average American will pay $3,600 increase for their health insurance. What exactly is a skinny plan? JOHN McDONOUGH: Well, a skinny plan is a health insurance policy. The premium will tend to be more affordable, but the cost sharing—the deductibles and the copayments—will be sky high, far above what we’re seeing today. And it has all kinds of limits in terms of what it covers. So it doesn’t cover maternity care. It doesn’t cover mental health and substance abuse disorders. It doesn’t cover prescription drugs. That is what most individual health insurance was like prior to the Affordable Care Act. And people had very degraded coverage and found that they had coverage, but then they were unable to use it. We have some of those problems now for people in the ACA. And there’s a real effort—there was a real effort in the campaign last fall to articulate an agenda to get at some of those problems. But the Republican agenda takes all of those problems and tries to make them substantially worse. AMY GOODMAN: So, President Trump promised to help people have affordable healthcare. This looks like a corporate welfare bill for the insurance companies. How do the insurance companies benefit from this? And did they write this bill? JOHN McDONOUGH: They clearly had a seat at the table in terms of giving advice. I would—I would caution against this being an insurance industry plot. The insurance industry is just business, and they want business that will enable them to do well financially. And far more important in driving this legislation are the tax cuts included as a centerpiece of it for wealthy Americans. The 400 wealthiest families in the United States will get a tax break from this law of, on average, $7 million a year. And the 160 million families with incomes below $200,000 a year will get absolutely nothing, except higher premiums, more cost sharing and fewer benefits. That’s really what’s driving this and is much more the focus, rather than the healthcare industry itself. I think the insurance industry is looking after its own bottom line, nothing else. What’s more important is, you look at who is lined up against this law: the American Hospital Association, the American Medical Association, the American Nurses Association, AARP. And those are just four examples of literally hundreds and hundreds of organizations, national and state, who have lined up against this. The insurance industry isn’t even on—in public, in favor of this law. There’s almost no one standing with President Trump and Speaker Ryan, saying, “We endorse this law.” The U.S. Chamber of Commerce, the medical device industry, because they’re getting a tax cut—you go after that, and there’s nobody. There’s not even the far-right groups like the—like the Americans for Prosperity and the Heritage Action. Even they are against it. So, it’s really extraordinary how this legislation has brought together organizations all across the country from both ends of the political spectrum. But very much the people in the healthcare sector who focus on patients, medical care, are almost unanimously lined up strenuously against this Republican agenda. AMY GOODMAN: Well, John McDonough, I want to thank you for being with us, causing many to call this not a healthcare bill, but a wealthcare bill. John McDonough, professor at the Harvard Chan School of Public Health, served as senior adviser on national health reform to the U.S. Senate Committee on Health, Education, Labor and Pensions, and also served as executive director of Health Care for All in Massachusetts, playing a key role in the passage of the Massachusetts Republican healthcare reform bill known as Romneycare, also author of Inside National Health Reform and was a chief aide to former Senator Ted Kennedy. This is Democracy Now! When we come back, a filibuster is being promised around the Supreme Court confirmation of Judge Gorsuch. We’ll look at one of his cases, the case of the frozen trucker. Stay with us.